"You're 12 years old? Hmm. Being 12 you haven't really experienced very much of the pain or the suffering or the anxiety of life, which you will, but in the meantime, you see what this says? This says with passion." Before Tom Hanks became one of the most highly acclaimed actors of our time, he primarily starred in lightweight comedies. The most famous of these is Big, but there are others that have largely been forgotten, such as The Man With One Red Shoe. Like in many of his early movies, Hanks displays his warmth and charm here and it is easy to see why he became such a successful actor. Richard Drew (Hanks) is a successful violinist that winds up entangled in a dangerous game of espionage. Without the slightest clue of what is going on, he is approached by Brown (Edward Herrmann) at the airport, because Drew is wearing only one red shoe. This is all a diversion on Brown's part, who is acting for the CIA director, Ross (Charles Durning), in order to prevent Ross' dismissal from power. Unbeknownst to Drew, a team of renegade CIA agents, led by the corrupt Cooper (Dabney Coleman), begin to track his every move and constantly attempt to kill him, because, according to their information, he has evidence of a drug deal that will put Cooper in jail. The top agent tailing Richard is a beautiful woman, Maddy (Lori Singer), and the two are immediately attracted to one another. The problem is that Richard's best friend's wife, Paula (Carrie Fisher), is also attracted to him. This prompts her husband, Morris (Jim Belushi), into a jealous rage that rivals the danger Richard faces from the CIA. The subplot of Richard's adulterous affair is a miscalculation by screenwriter Robert Klane, because it diverts attention away from the main story and raises questions about how good of a person Richard truly is. In a movie like this, it is important that the lead character be upright, but having Richard betray his friend raises questions about his character. Luckily, Tom Hanks is such a amiable person that it is easy to like Richard Drew. Thankfully this part of the story is pushed aside and the espionage continues, with Richard being shot at, tranquilized, finding true love, and even having all of the CIA's GPS programs directed towards him. Director Stan Dragoti has a good handle of this material, with efficient pacing of the action and comedy, accompanied by a pleasant musical score from Thomas Newman. The movie is dated now, but it does have a charm (thanks primarily to its cast) that can enable one to overlook its flaws. To be sure, some of the jokes fall flat, particularly the physical humor and Morris' jealousy. Yet there is some funny dialogue, particularly between Ross and Brown, that makes this an enjoyable experience for those in the mood for a light comedy. Image Transfer Review: Fox has released The Man With One Red Shoe on DVD with both a pan-and-scan and 1.85:1 anamorphic widescreen transfer. Each version is a single layer transfer on one side of a double-sided disc. The widescreen rendition looks average, with some grain and dirt being present, particularly during the concert scene. The age of the film is apparent throughout, which makes this a less than stellar image. Audio Transfer Review: Accompanying the average image transfer are equally mediocre sound mixes. The English Dolby Stereo track contains no sound separation, but gets the job done. The mix is spread across the front soundstage, with the surround sound speakers getting no activity. Dialogue is clear and sound effects, as well as music, are well balanced. There are also mono tracks in English, French, and Spanish. 3 Other Trailer(s) featuring Cast Away, Big, That Thing You Do! Extras Review: For supplemental materials, Fox has provided four trailers of Tom Hanks movies available from their archives. First is the trailer for The Man With One Red Shoe, presented in 1.85:1 anamorphic widescreen and with Dolby Stereo sound; That Thing You Do! 's trailer is also shown in anamorphic widescreen (2.35:1) and with Dolby Stereo. The other two trailers are for Big and Cast Away, each of which is shown in 1.33:1 and with Dolby Stereo surround. 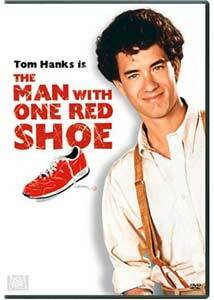 Fans of Tom Hanks should take a look at this amusing comedy. The movie, as a whole, is a mix, but it's a nice 90-minute escape from the world. The DVD is fairly low on extras, with only an average sound mix and transfer. However, if you come across it on the shelf, give it a rent.